The first functioning prototype of Buddy, the Life-Collar was created by Tadas Juknius in Smartmedic company, then PhD student at KTU. Later, working together with researchers of KTU Faculty of Mechanical Engineering and Design – Valdas Grigaliūnas and Algis Karpavičius – Juknius developed and improved the prototype. “We have introduced our prototype in international fairs, and received very positive reviews. 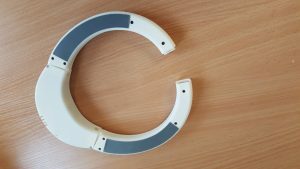 The next stage is designing a prototype for mass production”, says Kristina Judinė, head of the company Smartmedic, which is a commercialisation partner of Buddy, the Life-Collar.